I was supposed to run my first half marathon at SCKLM (Standard Chartered KL Marathon). 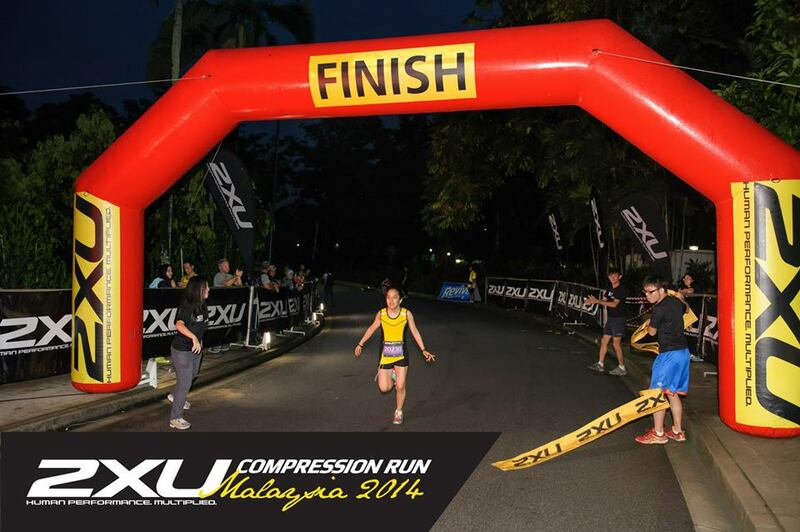 Registering for the half for the 2XU Compression Run was something I did on an impulse. I regretted my decision soon after. Just about a week ago I requested to change to the Women Open 10KM category. They wanted to charge a RM30 processing fee, which I thought was totally not worth it. RM65 + RM30 to run 10KM? Nah. So I left it at that and decided to take this race as part of my training. Yes, I honestly didn’t plan to compete. I was planning to follow the 2 hour pacer and even told Kevin that I will only be back after 2 hours. As i didn’t have it in mind to compete, I wasn’t race ready. I didn’t rest enough the day before (I only had 2-3 hours of sleep and I was out the whole day) and didn’t pay any special attention to what I ate. Actually, the thought of not competing eliminated unwanted stress/pressure and I was calm. I had no clue on how to prepare for my first half marathon. Everything was by trial and error. I woke up at 3am (2 hours before the flag off) to get ready and have my breakfast. I usually eat 1 hour before a 10KM race. Since I was planning to eat a little more, I allocated 2 hours for my food to digest. I had toast, bananas and a powerbar. We arrived at Lake Gardens 45 minutes before 5am. I was feeling rather fresh and energized. The weather was perfect. It had rained the night before so it was wet and cool. I casually strolled to the starting line and I was right up front! About 5 minutes past 5am, we were off. As usual, I darted out. I have this bad habit of going out too fast at the beginning. I had to keep reminding myself that it was 21.1KM and that I had a long way to go! 200 meters in and we were greeted with the first incline. I heard a lot about this route before the race, about how it was very hilly and challenging. The rumors were TRUE! It was insane. Studying race routes before races is not my thing. I don’t fancy knowing what I’m up against. I like “discovering” the route on race day. I was glad I did the same for this race. If I had known how crazy this route was, I would have been demotivated at the starting line. Running is not all about your physical ability; it is about your mental ability as well. In fact, it is more mental than it is physical. It’s all in your head! As cliché as it may sound, you have to believe in yourself. Believe that you can do it. That is the first step. *hint hint* In terms of pace, I was just as clueless. My goal was to either maintain the pace or speed up. I told myself that if I felt good then go for it. I didn’t reserve any energy for anything because I didn’t know what was ahead of me. Every hill came as a surprise and kilometre after kilometre, I gave my best. There were many U-turns throughout this route. It was pretty scary as I could see how far or how near my opponents were. The only good thing about these U-turns is that you are able to cheer for the other runners. I felt a surge of energy every time my friends /other runners cheered for me. It made a lot of difference! THANK YOU! I was constantly monitoring how I felt throughout the race. I usually ignore water stations but this time, I made it a point to drink at every station even if it was just a sip. In terms of fuel, I ripped my gel pack after passing the 10KM mark. I was actually planning to take my gel after 1 hour but I didn’t want to wait until my body was crying for it. I didn’t want to wait until I felt tired or cold before fuelling up. The only mistake I made was taking the gel without water which threw me into a mini coughing fit. Thankfully the water station was up ahead! We ran the whole course in the dark. I could barely see the road beneath my feet. Thankfully there were road marshals at every major turn. After inching my way up the last hill which felt like death, the race was finally coming to an end. I could smell the finish line! A wave of energy coursed through my veins at the thought that I had 4KM left. Again, it is all in your head! Your body is capable of it, you just have to convince your mind. Crossing the finish line was the best feeling ever. 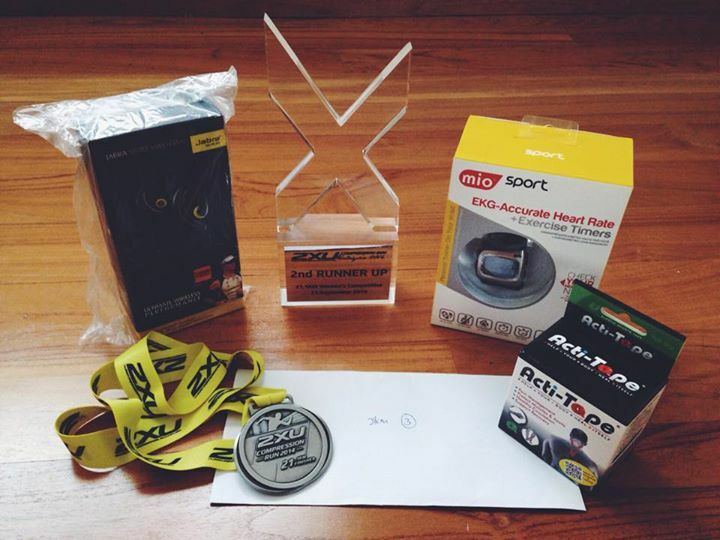 My first half marathon, done and dusted in 1:43:22. Kevin made it just in time to catch a glimpse of me running through the last stretch. He wasn’t expecting me until after 2 hours (because I said that I wasn’t planning on competing). He was contemplating on a nap but he had a hunch to be there earlier (Yay! So much love!). 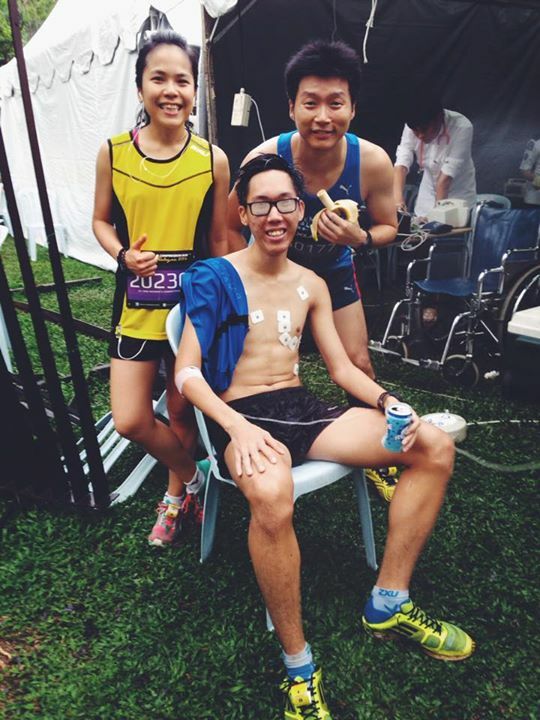 With Voon Ying who also finished strong! Thumbs up! Yvonne, my colleague, took part in the 10KM category. Zi Shen who didn’t wait for me. We crossed paths 3 times throughout the race! Grrr! He also said he was going to “take it easy”. Lies, all lies! Lucas, on my left, did really well too! ParX team mate, Goh Jing Jing. Doon! She has improved so much! So proud of her. The only goal I gave her was to keep running. Every time she felt like stopping she could imagine my nagging voice in her head. Haaaaa! I guess that’s a good thing! Well done girl! Daniel hit his PB but he ended up on a drip at the emergency tent. Got a shock when I heard that he fainted. Thank God he was okay! Team Dirigo – 1, 2, 3! This route was perfect for my half marathon debut, challenging with many unexpected twists and turns. No regrets. I truly enjoyed every moment of it. Zooming down the hills and climbing up others in the dark was pretty exhilarating. Yep, this race was totally RAD! Very happy with my first half marathon! Looking forward to all the other races in the future! Bring it! Hi Adele, I’ll be running my second half marathon this coming October, at SCKLM. My first time was at We Run Nike 2015 and I clocked in at 3hrs 30 mins. I’m not an experienced runner like you. I normally complete 10km in 1hr 30 mins. The cut off time for SCKLM will be 3 hours, can you share some tips on how I can improve my time. I have not done strength training for some time. I’ve only been attending spinning classes at gym on weekdays and I run + walk at the park on Sundays. Running on weekends only is not quite sufficient to help improve your time. You need to build up on mileage. You can start off with clocking 20-25KM per week! Hi Adele, I’ll be running my second half marathon (hm) this year at SCKLM. My first was We Run Nike and clocked in at 3hrs 30 mins. I am not an experienced runner like you. I normally finish 10km in 1hr 30mins. Can you give some pointers on how I can complete the hm in less that 3 hours? As 3 hours is the cut off time for hm at SCKLM. Glad that you decided to join your 2nd HM! Good on you! Well, what is your running routine like? You can add a long run (20KM) every weekend and do some tempo and interval runs (Speed work). All the best! !